It hit me out of nowhere, seemingly, long after the initial buzz of the new release had faded from the daily talk of the fragrant corner of the blogosphere: an intense craving to smell (and wear and own) Penhaligon’s Amaranthine. Penhaligon’s is one of those houses, est. 1870, that I lump in with Creed, Floris, and Houbigant; namely, houses that have been around a long time, and are known for conservative, “appropriate” fragrances (alternately, see “stuffy,” “stodgy,” “sober,” or “matronly”). But Amaranthine is something different, something new. Hot-shot perfumer Bertrand Duchoufour was brought in for the project, and the results have shaken up the collective perfum-o-shepere’s perception of that staid house. What is happening here? It’s a Tropical-Oriental! Amaranthine is an odd-duck, but odd-ducks are my favorite— one of the last perfumes that intrigued me on this level was Nuit de Tubereuse (also by the rockstar BD, for L’Artisan). The thing that I like about each of these compositions is that while they are decidedly ODD, interesting, and original, they are also elegant and pretty. 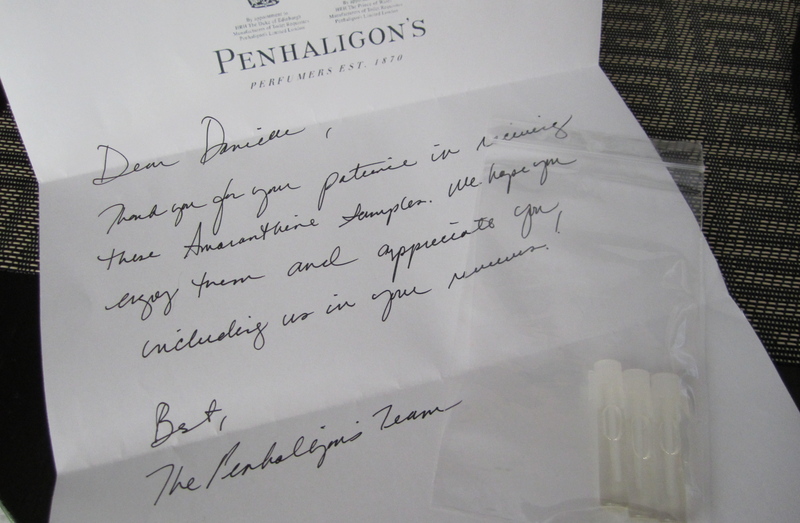 I guess that’s why Amaranthine works for Penhaligon’s… it’s eccentric, but it’s got class. Amaranthine is pretty great… I don’t get any naughty bits, but it is warm and floral and comforting all at once. I shocked Vanessa (Bonkers about Perfume) by telling her that I wear it to church (she loves it and finds it deliciously naughty). I’m still on the dang fence about Nuit de Tubereuse. It’s not very tuberosey, which is a drawback for me – yes, I know your feelings on tuberose, and they baffle me, but everybody’s entitled to their opinions. I don’t like patchouli. I don’t like orange blossom. I hate Youth Dew. Aaaaanyway, back to NdT: there’s a mildew note in the opening that just kills me but which nobody else seems to even notice. I put it on one afternoon and while I’m still thinking, “Ewww, mildew,” my husband comes in and says, entranced, “What IS that? It’s enticing.” Huh. Huh. Mals, I don’t get “naughty bits” either! I agree with your comforting assessment—it reminds me of Safran Troublant (milky/metallic), perhaps my favorite comfort scent. Perfectly appropriate for church! NdT isn’t tuberosey at all, which I think negates it’s claim to be a “tuberose for tuberose haters.” That title belongs to Kim Kardashian’s fragrance, I think, because it’s a big white floral without teeth. NdT’s appeal lies, for me, in the neon-green vegetal sci-fi vibe… which everyone needs in their collection, no? I don’t get mildew from it—but I think I know what you mean—there’s that mango note, which has a somewhat garbage-y tingle to it, which I find really fun 🙂 Enticing, huh? Well, all right! Amaranthine certainly isn’t jokey, and I like that you’ve termed it that way—because with all that weirdness, it could easily have been just that… for some reason it reminds me of the character that Penelope Cruz played in Vicki Christina Barcelona (I love Woody Allen! ), a beautiful, genius artist, who is totally bat-sh*t.
I kinda hate tropical scents (Ormonde Jayne is excused from this generalized hate), but just when you think, “Eew, tropical rot,” you get hit with the oriental side. It’s like a dance between Carmen Miranda and Cleopatra—they each hold their own, maintaining their distinctive personalities, while at the same time creating an overall “greater-than-the-sum-of-it’s-parts” whole. As ever, you’re spot on with this, Dee. Amaranthine’s milkiness is not for me but I really admire it (gotta love an odd duck) and Penhaligon’s for stepping out of the box. As for Nuit de Tubereuse, it is one of the very few scents I am persisting with. Normally I’m quick to shout “NEXT!” but I do feel I’m getting somewhere with it and like I’ve said to Birgit, I think it will finally click in the Summer with a bit of heat around it. I see it as tropical too. BTW “hot-shot perfumer” is a perfext description for Bertrand D! That milky note is quite prevalent, and I can easily see how it would make Amaranthine a no-go! NdT is just so intriguing, isn’t it? I feel like I’ve heard several people say that it’s not immediately likable, but that they keep trying… I think that your standpoint perfectly illustrates how original it really is—there really isn’t anything like it; while that’s not enough to justify it’s existence, I do find wearing it to be a pleasurable experience. I think I said before (somewhere), that it keeps pulling my attention to it, in a way grounding my over-active mind. I hope that you’ll keep us posted on your courtship of NdT! I LURVE Amaranthine, it’s very special to me. It’s one of a kind, for sure! Clearly I need to start tweeting about this scent…. I’m the odd duck here because I really don’t like Amaranthine. I’ve given it enough chances, thinking it might grow on me, but no, it doesn’t. I’ve concluded that the problem is that the florals are far too strong. I had the same issue with Penhaligon’s Violette – way too strong and heavy on the ionones. I haven’t tried their others. You know Ellen, I hardly smell florals at all! I wonder if I’m anosmic to an ionone? To me it smells like sticky, sappy, green vegetal undergrowth, then segues into the creamy/milky/spicy-ness—with the “sucked silver spoon” accord wafting about the whole… so interesting! LOL! All things British are very British, aren’t they? I think I would like to live in England, because there I would have normal teeth, where as here I’m snaggle-toothed. Haha! The florals in Amaranthine aren’t ionone-based, it’s something else. I got it out and sniffed it again, and I can see how it smells green and sappy, but it also smells strongly floral to me. Anyway, I’ve been working on a perfume this evening, and my nose is about ready to call it a day, so I think I’ll revisit Amaranthine again first thing tomorrow morning. Now I’m trying to over-analyze it. Five tries! You are determined! LOL, I love that you are going to give it a sixth try— like Tara and Nuit de Tubereuse above, I think that with these scents, there is something oddly compelling about them that would make them difficult to write-off very easily.